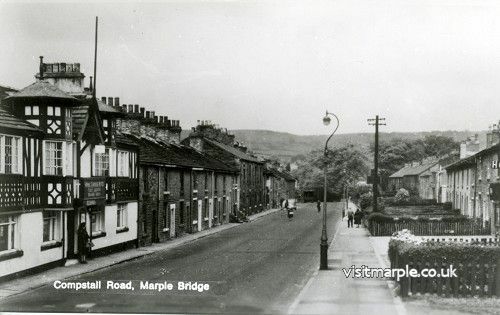 The Marple Website would love to encourage a growth in tourism to Marple; it's been one of the site's long-term objectives to raise Marple's profile and promote a positive image of the area. Only in our wildest dreams though, could we imagine rivalling the popularity of Marple in days gone by. It's hard to believe, but there were times when hundreds, even thousands, of visitors were received here each weekend, with extraordinary crowds on Bank Holidays. The Industrial Revolution brought about a rapid increase in Manchester's population and by the middle of the 19th Century many of these people began to seek respite on Sundays from the other six days of toil in the factories and mills. 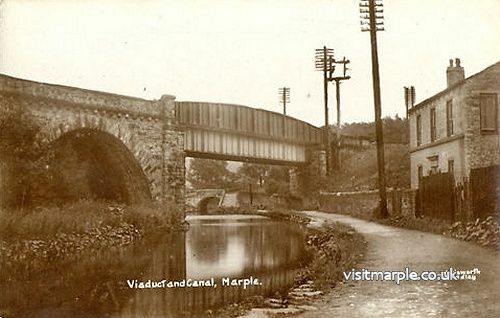 With the regular wages this work provided and improvements in transport as a result of the canals, and later the railways, Marple became a popular and affordable destination for day-trippers. Room for one more on top – maybe not! Obviously the large numbers of visitors presented many opportunities for enterprising businessmen and local traders, who vied with each other to draw in the crowds. The same Mr. Boulton mentioned earlier built the Queen's Hotel on the present-day site of the Aqueduct Business Park. According to descriptions from the period, the exterior of the Queen's Hotel was of a rather grand appearance, 'better suited to a much larger and more important town.' The interior was said to be of 'equal quality, affording ample accommodation with many facilities for enjoyment.' The hotel overlooked 'some of the most beautiful and romantic scenery in the world', whilst behind the premises were said to be large pleasure grounds extending to upwards of forty acres, these were 'laid out with a degree of splendour seldom to be met in such establishments.' 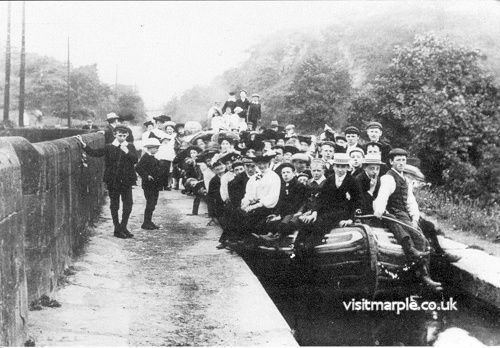 Sadly the popularity of the Queen's Hotel was short-lived and it only operated for a few years before the coming of the railways to Marple brought about the end of passenger travel on the canal. The crowds didn't stop coming, but the hotel was effectively bypassed and deteriorated rapidly. Most of the public houses we know (or knew) and love today were well-established businesses, often with roles at the heart of the community - like the Jolly Sailor, doubling as the village post office, or the Navigation, in great demand for sales, auctions, inquests and parties, as well as the sale of beer. In the mid 19th century, however, they had much more competition than the present day. The Beerhouse Act of 1830 permitted any householder, on payment of a licence fee of two guineas a year, to turn his premises into a beershop. Following the Act's introduction many of the beerhouses that opened were to close just as quickly, but after a few years things began to settle down, and those in the most suitable locations were able to thrive on a mixture of local trade and the growing popularity with weekend visitors from the city. During his extensive research to produce the excellent book 'Last Orders Please', local author Jack Turnbull discovered records of more than twenty such premises that no longer exist, including seven in Mellor and an incredible ten in Marple Bridge and Compstall! Busy Tearooms and the "Roman Lakes"
Tearooms were another great attraction and these were to spring up in many different places. Roman Lakes, an attractive name given to the millponds constructed to power Mellor Mill, was an extremely popular location, belying the impression given by the idyllic but usually quiet scenery down at the Lakes today. The attractions included boats for hire, tearooms, slot machines, postcards for sale and even a dance floor. The Tea Gardens of Roman Lakes drew in hundreds of visitors who would enjoy walking, boating and picnicking within the grounds, and the old turnstiles, through which they would enter, can still be seen today. 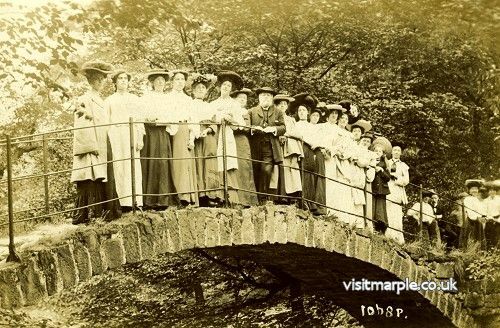 Despite all the facilities at Roman Lakes, the crowds were sufficient to support another tearoom just a few hundred yards away, at Floodgate Cottages, on the way to probably Marple's most photographed location, the Roman Bridge. Footnote: In recent years there's been a bit of a resurgence at Roman Lakes and they now have a wonderful Tea Room that does great food and excellent home-made cakes. They also host regular "Tea Dances" on the last Saturday of each month that have become very popular and are often sold out. 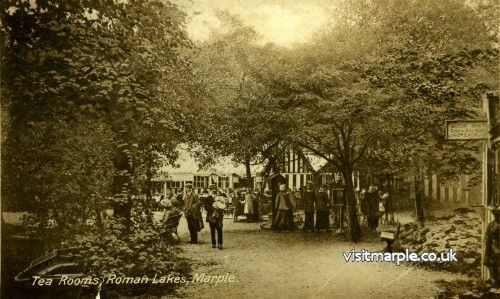 You could be forgiven for thinking that Roman Lakes must have been Marple's most popular destination but, surprisingly, this was not the case. This was achieved by one of our present-day local pubs with quite an amazing history. 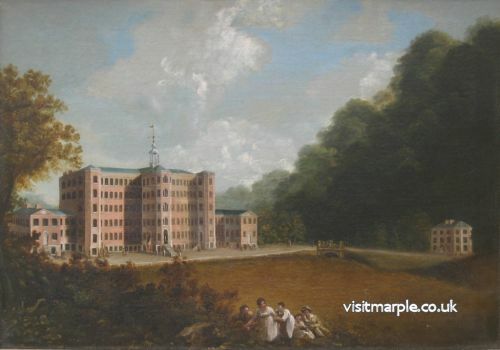 In 1825 James Warhurst became the first landlord of the Spring Gardens in Compstall. He was probably responsible for building the pub itself and he also leased a large plot of land behind it that he laid out as Pleasure Gardens. In 1837 the licence passed to his son, Caleb, who was to remain as landlord for 36 years. Caleb leased further land and during his tenancy turned the Pleasure Gardens into a major tourist attraction that frequently received several thousand visitors on Bank Holidays. The Pleasure Gardens featured a 'gooseberry avenue', originally planted by James, which became most famous. Other attractions included an aquarium, a monkey house, a dance floor and cages with foxes, alligators, a magnificent giant Derbyshire ox and a large variety of domestic and foreign wild fowl. Firework displays were often held and the many other forms of entertainment included brass bands, comedians, prize fighting, rifle shooting and even a tightrope walker. Within the grounds was a building called the Foresters Hall that was often used for local flower or fruit and vegetable shows. Unfortunately, in 1881 and 1888, landslips during severe storms resulted in large sections of the gardens being lost forever. This, and the coming of the First World War, saw the end of the Pleasure Gardens at Compstall. Today, there is so little trace of it left that it's hard to image the magnitude of this once great attraction. This page appeared as an article by Mark Whittaker in the October 2002 issue of the Community News, in our regular feature "Local History & Heritage with the Marple Website". Acknowledgement: 'Last Orders Please' by Jack Turnbull.